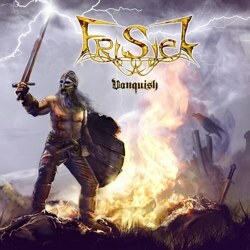 Epic folk metal band Fri Sjel from Spain has just revealed the cover artwork of its first album called “Vanquish” designed by the Spanish designer Marta Hdez. This project was formed in 2010 by Einsam Vuk, after years of searching for the right path and a unique sound. In 2013 the composition of their first album begins to take shape and in March 2014 the band began to record it. “Vanquish” is an album full of surprises, mastered and mixed by Henrik Larsson at La Roca Studio (The Haunted, Amon Amarth, Vomitory, In Flames, Arch Enemy, Tenebre, etc) and a long list of musicians who collaborated on this album like Gaby Koss (ex-Haggard, Equilibrium, Cantus Lunaris, Nota Profana), Albert Dannenmann (ex-Blackmore’s Night, Cantus Lunaris) Silvia Bonino (Folkstone), Tommaso Corvaja (Cantus Lunaris, Ion of Chios), Ireheart Bergin (Scythia), Dave Khan (Scythia), Jérôme Hippolyte (Neria), Francisco José Romero Guerrero, etc. Soon the band will update more news of the album and the release date.